A strange bend was spotted in Saturn's two outermost rings as they passed behind the planet in this view from NASA's Cassini spacecraft. Cassini took the image on June 9, 2016, and NASA released it on July 25. A bizarre new photo captured by NASA's Cassini spacecraft shows a strange bend in Saturn's two outermost rings. 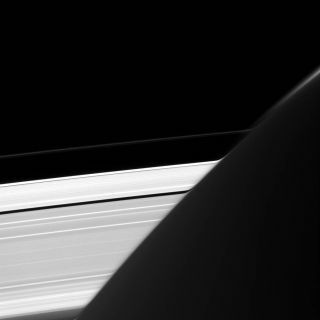 The apparent bend in Saturn's A and F rings can be seen where the rings pass behind the planet. However, the rings aren't actually warped; light reflecting from them creates an optical illusion, NASA officials wrote in a statement on the new image on Monday (July 25). The dazzling rings of Saturn are very bright. While the planet's upper atmosphere absorbs most of the light radiating from the rings, some of it passes through the atmosphere. This acts like a large lens, bending or refracting the light as it travels through space. That's why the rings appear warped in the new Cassini image, NASA officials explained in the statement. This spectacular photo was taken on June 9 by Cassini's narrow-angle camera as the probe was flying at a distance of 1 million miles (1.8 million kilometers) from Saturn, though NASA ultimately released the image on July 25. The Cassini spacecraft has been orbiting Saturn since 2004 and is a joint project led by NASA, the European Space Agency (ESA) and the Italian Space Agency. For several years, Cassini cameras have captured marvelous photos of Saturn's ring system, as well as the planet's many moons. The probe is currently on the Cassini Solstice Mission, which will come to an end in September 2017.